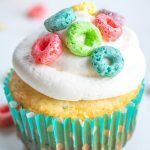 These easy Froot Loops Cupcakes, are made with sweet, crunchy, Froot Loops, boxed cake mix, and topped with a cereal milk buttercream. Fill a large bowl with Froot Loops and then pour the milk over it. Place the bowl in the refrigerator and let the cereal steep in the milk for about 30 minutes. Strain the milk into a separate bowl and discard cereal. Make cupcake batter according to the instructions on the back of the cake mix box. Substitute cereal milk for the water listed in the ingredients (Do not use water). Add 1 cup of crushed Froot Loops to the batter, folding in gently. Place cupcake batter into cupcake liners in a muffin pan, filling each one 1/2 full. Bake according to cupcake instructions on the cake mix box. Let baked cupcakes cool completely. Once cooled cut a small core from the center of each cupcake. Fill each cupcake hole with marshmallow cream filling. Pipe the cereal milk buttercream frosting onto each cupcake and garnish with whole Froot Loops. Melt the butter in the microwave and add it to the marshmallow cream, stirring until mixture is smooth. In the bowl of your mixer add room temperature butter and powdered sugar. Using the whisk attachment mix the two together. Add cereal milk 1 tablespoon at a time until you reach a smooth, pipeable consistency.